Former Tuskegee University president Benjamin Franklin Payton was born in 1932 in Orangeburg, South Carolina. His father, Reverend Leroy Payton, was a Baptist minister, farmer, and teacher while his mother, Sarah Mack Payton, was a homemaker. Benjamin Payton graduated with honors from South Carolina State in 1955, earning a bachelor’s degree in sociology. In 1958 he was awarded the Bachelor of Divinity degree in philosophical theology from Harvard. He earned a master’s in philosophy from Colombia University in 1960, followed by the Ph.D. in Ethics from Yale University. In 1963, Payton became assistant professor of sociology, religion, and social ethics at Howard University. During this time he also served as the director of the school’s Community Service Project in Washington, D.C. Two years later he became the director of Office of Church and Race for the Protestant Council of the City of New York. In 1967 he became the president of Benedict College. He left the post in 1972 to become program officer of Education and Public Policy for the Ford Foundation. In 1981, one hundred years after its founding, Payton became the fifth president of Tuskegee Institute. In his second year at Tuskegee, Payton served as educational advisor to Africa on a seven nation tour with Vice-President George Bush. During the tour, Payton discovered that although many Africans had heard of Tuskegee, they were unsure of the type of institution it was. To clarify this situation, Payton brought this issue to the school’s board of trustees and in 1985 Tuskegee Institute changed its name to Tuskegee University. Payton also received several presidential appointments throughout his career. In 1983 President Ronald Reagan appointed him to the Board for International Food and Agricultural Development. He also served as a team leader of the Presidential Task Force on Agriculture and Economic Development to Zaire in 1984. In 1996, Payton formed the Tuskegee Syphilis Study Legacy Committee whose goal was to pursue a government apology for the unethical use of African Americans as test subjects for the 40 year study on the degenerative effects of the disease. As a result, President Bill Clinton publically apologized to the participants of the study and their families. In addition, the President announced that a $200,000 grant would be awarded to Tuskegee to initiate a National Center for Bioethics in Research and Healthcare. In 1998, Payton addressed Congress seeking approval of Moton Field, the training grounds for the Tuskegee airmen, as a national historic site. As a result of his efforts, Congress approved the field as a national historic site in the fall of that year. During his tenure at Tuskegee, Payton led the restructuring of all academic programs and the renovation of the entire campus. 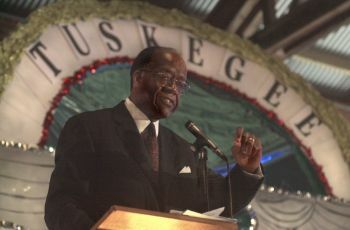 Under his leadership Tuskegee University developed its first Ph.D. programs and raised more than $160 million dollars for the campus endowment. Dr. Payton and his wife, Thelma, have two children. Benjamin Franklin Payton retired in August 2010. Payton died on September 28, 2016 in Estero, Florida. He was 83. African American Almanac (Detroit: Gale Research Inc., 1997); “Dr.